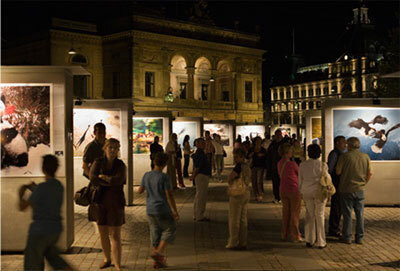 Outdoor public exhibitions consisting of 100 giant prints, each 1.8 meters across, floodlit at night, free, and open to the public 24 hours a day. 2006 – Copenhagen, Denmark: Kongens Nytorv, 16 May – 22 October (5 months) Verified visitor numbers exceeded one million in the first 3 months. 2014 – Spirit of the Wild Bosham Gallery, No.1 The High Street, Bosham, West Sussex 15 August - 15 September. 2012 – Beneath the Surface: South Africa in the 1970's London Festival of Photography at The Guardian Gallery 1-28 June. 2011 – Konica Gallery, Tokyo, Japan Spirit of the Wild - September - October. 2012 – Natural and Cultural Monuments of the World Museum Gasometer Oberhausen, Germany - April 2011 to October 2012. Spirit of the Wild is a free outdoor exhibition featuring Steve Bloom’s photographs of animals around the world. The exhibition consists of one hundred large format weather-sealed prints, floodlit at night, and open 24 hours. The images are accompanied by informative captions, designed to raise public awareness of wild animals and the environmental issues which affect them. The visual narrative enables viewers to go on a journey to all the world's continents as they move around the exhibition. The positive, uplifting images leave viewers with a poignant sense of 'what we have to lose'. The giant prints, when viewed close, fill the peripheral vision. This soft, un-preaching approach aims to inspire people to be more considered in their approach to environmental matters. The wild tiger's eyes, staring from the undergrowth, remind people that there are more tigers in captivity than in the wild. Aimed at peoples of all ages, including those not normally responsive to art photography, the exhibition is designed to be both informative and entertaining. It usually runs for a period of between three months and one year and has been seen by millions of people in eleven European cities. In Copenhagen, more than 1.4 million visitors were officially counted during the five month run. The exhibition has an associated catalogue and several books, Spirit of the Wild, Untamed, and Elephant. Children's books include Elephants - Book for Children, My Big Cats Journal, My Favourite Animal Families and My Polar Animals Journal.